Here is how I assume most people's lives go - wake up early, get ready for work, travel to work, work, maybe lunch, some more work, travel home from work, dinner, time filler until bedtime, sleep. Repeat. There is a simple and rewarding routine to this, especially on that day every week, or two weeks, or the first and fifteenth when money appears in your bank account to reward you for the time you have spent working. When you are unemployed there is no certainty. This is not a vacation in the way that scheduled time off of work is relaxing. Think of unemployment like the crappiest vacation you have been on, it rains every day, the mosquitos eat you alive, the ocean is full of jellyfish, and worst of all, Cuba runs completely out of rum (or Mexico and tequila, or Jamaica and joints, you get where I'm going with this). It is such a bad vacation that you are in fact looking forward to sinking back in to the comfort of what you know, working half assed at job that is fairly meaningless. This is preferable. Don't worry - I have the perfect solution! Here is my guide on how to spend your day, and various ways to feel productive about doing nothing. 8-9am - wake up. Sometimes this is earlier, if you have spent the night tossing and turning sleeplessly, it is fine to wake up with the sunrise. Pretend you like it. Say things like, "I'm really a morning person" or "I'm most productive in the morning" or "I don't want to get used to sleeping in, soon I will have a job and have to be up early". You don't have to say these things to other people, just repeat them quietly to yourself until you believe them. 9am - Regis and Kelly! This is the highlight of your day. Don't miss this for sleep, you can catch up on sleep during naptime. It is Regis' final season. You might think this is some sad addiction I have developed during my long period of unemployment, but that is not true. 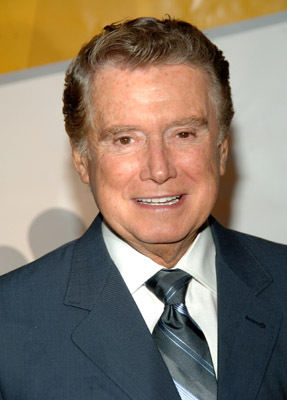 Even when working I used to prefer afternoon shifts so that I could watch Regis. My boxer puppy is named after him because they share the same adorable wrinkly old man face. 10am - feel free to continue watching tv, whatever is on, especially reruns of Rich Bride, Poor Bride you have already seen, or any of the Housewives. I won't judge. Usually this is when I switch from tv to internet. I check my email, facebook, other email, job postings, blogs. I pretend to be looking for jobs, but I know that nothing new has come up since I last checked around 10pm the night before. I don't actually apply for anything yet, I go back to facebook and look at some random pictures. Finally I might work up the emotional strength to write up a cover letter and apply to a few jobs. I might also leave this for the afternoon internet session. 12 - walk the dog. Stretch this out as long as possible, it is perfectly acceptable to walk the dog for up to three hours. This is good exercise for you both. You are a wonderful dedicated owner. There is absolutely nothing sad and pathetic about having three hours in the middle of the afternoon with nothing to do except wander around. Try not to actually cry while doing this, the neighbours will start to wonder. Let them think you have an exotic job that allows you to be home in the afternoon. 2-3ish - lunch, whenever you return. I often consider skipping this meal, but the more elaborate a meal you make the more time you can use up. Consider having more than one course. Get out that cookbook you never thought you would have time to use. Start eating strange things from cans - for example stuffed vine leaves, no name brand, are delicious! Food poisoning can be a great way to spend a few days. After lunch is usually when I start to get desparate. I read entire books during this time of day. I try to make social appointments with my other unemployed friends. Make friends with people on maternity leave, or students with strange schedules. Start calling your grandmother more often. This is often when my obessive compulsive cleaning streak starts to show itself. This is also a good time to recheck your email, or to take a nap. 6ish - normal people with real world jobs are home! If you are not too deep into the scrubbing out the fridge or already out for coffee, start calling these people. Begging and crying is permitted if it helps get you an invite to dinner. No level of desparation is too low at this time. Tell them to come to your house, serve them vine leaves and left over KD. Night time is easiest - sleep, as soon as it gets dark this is acceptable. Go to bed at 9pm if you have to. Take a hot bath, or a gravol, or both, whatever gets the job done. Good luck! Let me know if you have any tips or tricks to fill in time. I recommend watching Days of Our Lives at 1pm or Days ahead at 3pm. Thank me later. Sorry - us old boomers would love to retire before 'freedom 82' but we can hardly take our vacation time because we're scared of losing our jobs because you guys are so highly educated. I think that's mean to compare Regis the puppy's face to Regis the human's face! The puppy is way cuter!